Giving Up: Not An Option! Trading gave me an exposé to my personality. I had to re-assess myself and my goals. Being very analytical, I have the tendency to over analyze; at times, analyze to paralysis. I am a perfectionist, but I learnt that it is not in my best interest to be a perfect trader- looking for a perfect system with a perfect set-up. It does not exist. Instead, it is better to be a good and profitable trader: have a simple trade set-up, identify opportunities fast (without over analyzing) and use it to my advantage. I discovered that I trade fearfully- motivated by the desire to ‘not lose;’ consequently, I cut short winning trades and let losing trades run. Therefore, I gave myself permission to lose and learn from the experience. It is part of the learning process. One of the main things I’m instilling into my trading is the “Read and React” principle- taught by Todd. That is, trade based on what the platform is telling you and not what you feel the platform should be doing. It occurred to me that Shawn, Nate and all the partners of Apiary were once like me; they used to be where I am today. However, they kept at it and now, they are a success. I tell myself that as much as I want results, I cannot jump the gun- I have to ALLOW myself go through the process and keep at it! Though I am not yet where I want to be, I am grateful because I am not where I used to be and my slogan is- “I will get there.” Today, I’m happy and more confident in my trading. I look forward to when I will be funded; consistently practicing with patience, knowing that by the time I am funded, I would have become a refined trader who can hold her head high; because I am in the hands of the best in the industry. Congratulations on your achievement!!! I hope to be done with Silver I on Sunday/Monday. I absolutely agree with everything you said. I too am a perfectionist. I also WAS trading from fear that stopped me from realizing bigger gains and smaller losses. I am confident that if I stick with the Apiary Plan and not my own, I will be successful. Even with the best strategy and a perfect plan you will win only 60 to 70 percent of the time. I lost 1200 pips in my funded account just yesterday...made 1100 pips today, and didn't change a thing as far as my strategy and risk management goes. The important thing I guess is to treat losses as a business expense and don't be afraid to jump right back in. And I guarantee you Shawn and Nate still have losing days. Don't chase "Holy Grails". Find a strategy that works for you and perfect it. Study, study, study! Stick with it. It may take years to become profitable, but then you will have accomplished something that only 10% of all retail trader have done. Good luck to you! They say: Don't give up" Maybe that is why we are here! we are here to be challenge, to be a good trader, to be a professional trader someday. 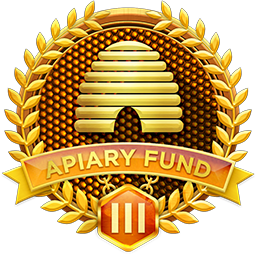 Thanks to the founder of Apiary Funds. I have learned a lot as well about under Beeline and watching on my trading chart in different time frame, night trading, day trading, London break, non farm payroll, Closing trade before 3 Pm, Setting up trade at 5 PM, training myself to get up at night 1-2 am, getting up at 5 - 8 am. You will get all figured and then you know what, which, and how. After all you'll end up writing all down the best trading strategic that work best for you. Make it simple. Other than that, you are on the go of taking profit, grow account,ect. Good luck and thank you for sharing. @c517: Thank you so much for your words of encouragement. @walt724: Thanks a lot for your comments! Truly, I believe the Apiary training is the best: to refine us and bring out the Trader in us. If we do not give up, but keep at it, we will be successful.. So, let's do this.. I wish you the best and welcome you to Silver11..
@kwk58: Thanks for your words of wisdom. Being able to deal with loses is very important to my success- especially jumping in right back and fighting it out, instead of fleeing. Also, accepting that no strategy is 100% perfect is critical. I appreciate your comments! @gldgrn9: Thank you so much for your comments: very encouraging! I am always happy to see people who have gone before me being successful. It encourages me the more because it is an evidence that it can be done. Same here, I am up at different times of the day: daytime, night, midnight and several times throughout the night- trying to see which trading session suits me best and testing different stategies... I believe I will figure it all out and look forward to becoming very skilled in trading. You are so correct, I got funded, the next trick is to actually make money. @rookie no more: Thanks a lot. You bet, I look forward to getting funded and actually making money!! !